Teasel cards. Pueblo & Presido case From the History Information Station Object: Pair of wool carders made by clamping the bristly flower head of the teasel plant (Dipsacus fullonum) into a wooden frame. The word "card" is derived from the French cardï¿½re, which means "teasel." This pair of carders is a replica of the type used at Mission La Purï¿½sima Concepciï¿½n. La Purï¿½sima Concepciï¿½n was founded December 8, 1787. The Mission is a State Historic Monument and is located four miles northeast of Lompoc, California. History: Before wool from a fleece is spun into a thread, it must be teased and carded. Teasing separates the wool fibers and removes debris; carding straightens out the fibers. 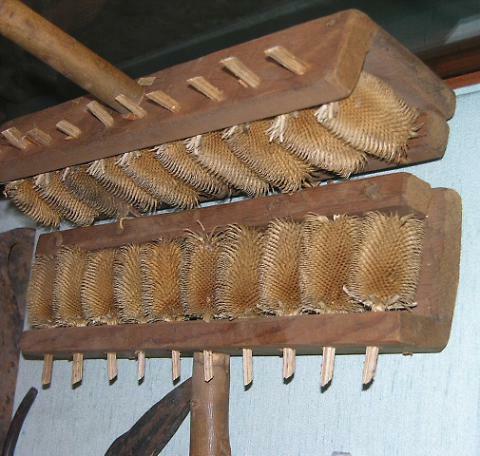 To card wool the left carder is placed on the lap and wool is spread evenly over the bristles. The right carder is stroked across the left carder several times, an action which straightens the fibers and make them fluffy. Clothes Make the Human The Franciscan missionaries to California were horrified by the what they perceived as the indecency of native dress. A sufficient supply of cloth for clothing the Indian converts was a prime requisite for founding a mission. Initial supplies of cloth were sent from Mexico; however, the enormous need for cloth explains the early emphasis on raising sheep at the missions. Female converts were trained to spin thread from wool and to weave it into cloth on the Spanish looms. At Mission Santa Barbara daily quotas were established: the carders were required to comb three pounds of wool; the spinners were required to spin one pound of yarn; and the weavers were required to weave ten yards of woolen cloth. Those who exceeded their quota were compensated for their excess production with wheat or glass beads.